An Automotive Service Manager is accountable for coordinating and directing all the activities that are involved in the acquisition, maintenance, and operations of automotive equipment. 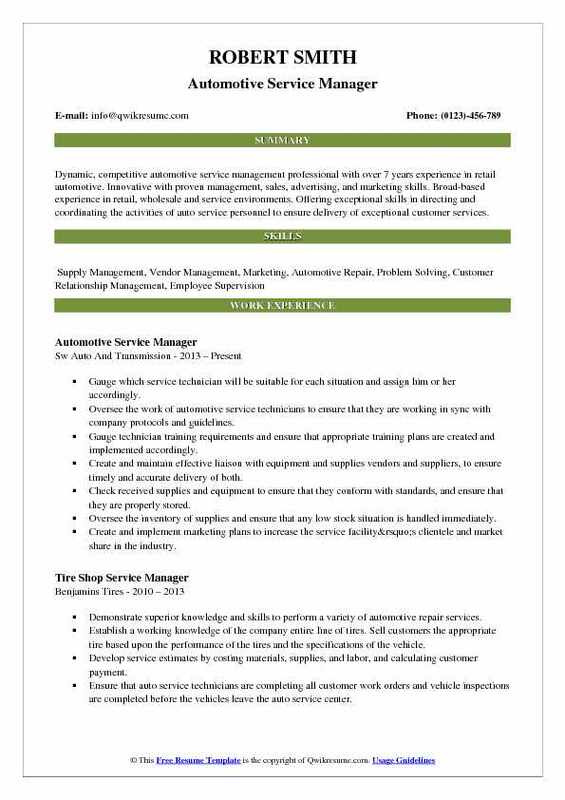 A successful Automotive Service Manager Resume emphasizes on job description such as coordinating the work of auto personnel, supervising the staff, conducting research or testing procedures, making that the vehicle complies with environmental laws and regulations, evaluating the maintenance cost, solving customer complaints, ordering parts or supplies, preventing operational delays during repair works, hiring and training new staff, and assuring maximum maintenance efficiency to customers. 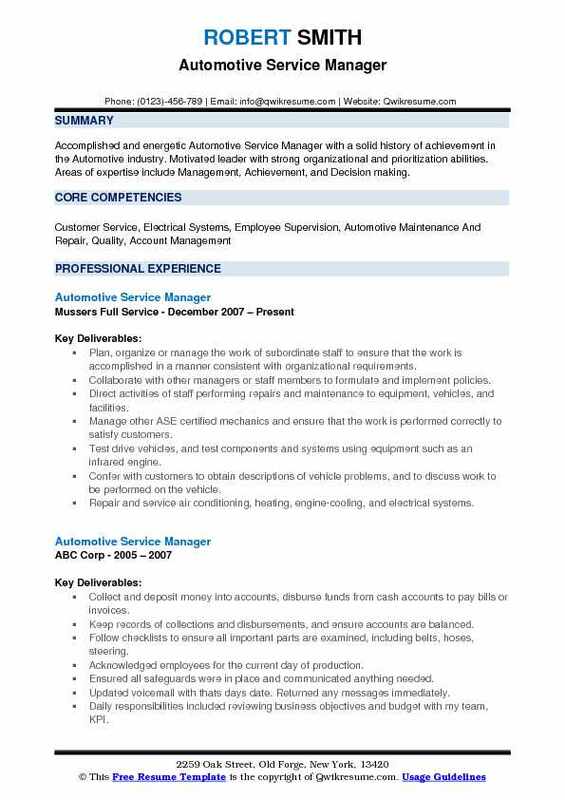 Employers prefer their Automotive Service Manager‘s to possess immense technical and general skill sets which may include some or all of the following – sound mathematical, computer and reasoning skills, familiarity with the parts and procedures of the automotive and its running, supervisory ability and quick analytical thinking capacity. 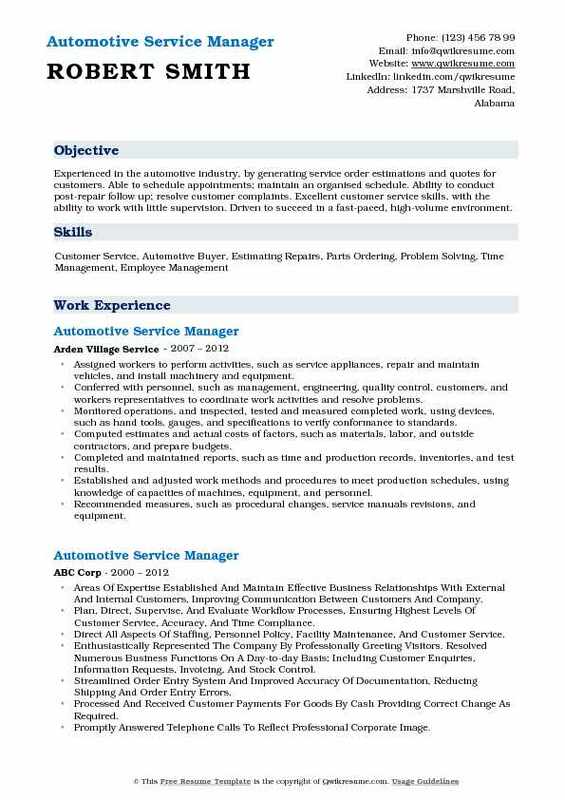 An Automotive Service Manager should portray in the resume a Bachelor’s degree in the field of Automotive or the equivalent with relevant work experience to gain this managerial position. 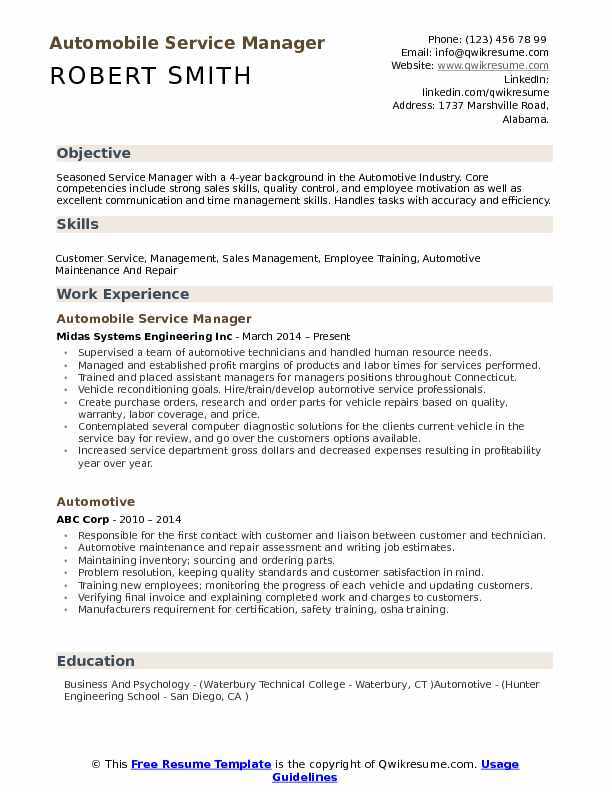 Objective : Seasoned Service Manager with a 4-year background in the Automotive Industry. Core competencies include strong sales skills, quality control, and employee motivation as well as excellent communication and time management skills. Handles tasks with accuracy and efficiency. Supervised a team of automotive technicians and handled human resource needs. Managed and established profit margins of products and labor times for services performed. Trained and placed assistant managers for managers positions throughout Connecticut. Vehicle reconditioning goals. Hire/train/develop automotive service professionals. Create purchase orders, research and order parts for vehicle repairs based on quality, warranty, labor coverage, and price. Contemplated several computer diagnostic solutions for the client's current vehicle in the service bay for review, and go over the customer's options available. Increased service department gross dollars and decreased expenses resulting in profitability year over year. Lead by example by providing extraordinary and truly exceptional service to maintain and increase overall customer service and customer retention. Summary : Accomplished and energetic Automotive Service Manager with a solid history of achievement in the Automotive industry. Motivated leader with strong organizational and prioritization abilities. Areas of expertise include Management, Achievement, and Decision making. Plan, organize or manage the work of subordinate staff to ensure that the work is accomplished in a manner consistent with organizational requirements. Collaborate with other managers or staff members to formulate and implement policies. Manage other ASE certified mechanics and ensure that the work is performed correctly to satisfy customers. Test drive vehicles, and test components and systems using equipment such as an infrared engine. Confer with customers to obtain descriptions of vehicle problems, and to discuss work to be performed on the vehicle. 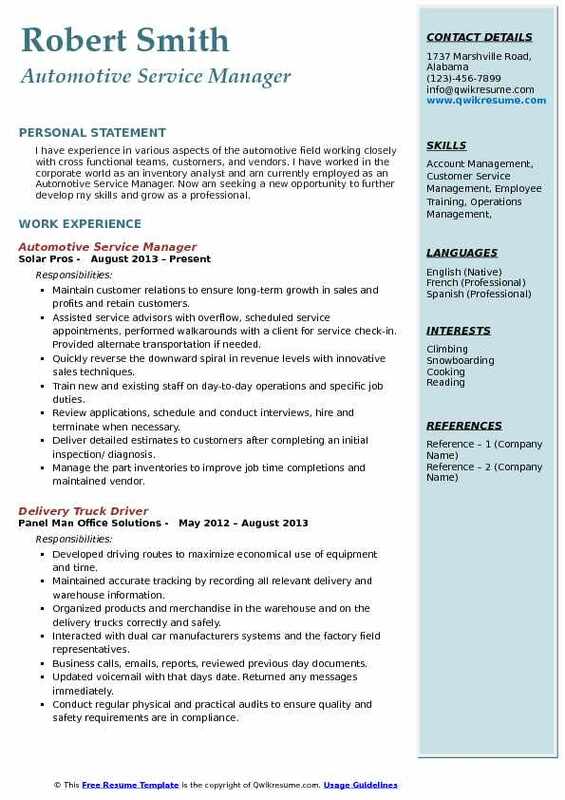 Summary : Dynamic, competitive automotive service management professional with over 7 years experience in retail automotive. Innovative with proven management, sales, advertising, and marketing skills. Broad-based experience in retail, wholesale and service environments. Offering exceptional skills in directing and coordinating the activities of auto service personnel to ensure delivery of exceptional customer services. Gauge which service technician will be suitable for each situation and assign him or her accordingly. Oversee the work of automotive service technicians to ensure that they are working in sync with company protocols and guidelines. Gauge technician training requirements and ensure that appropriate training plans are created and implemented accordingly. Create and maintain effective liaison with equipment and supplies vendors and suppliers, to ensure timely and accurate delivery of both. Check received supplies and equipment to ensure that they conform with standards, and ensure that they are properly stored. Oversee the inventory of supplies and ensure that any low stock situation is handled immediately. Create and implement marketing plans to increase the service facility’s clientele and market share in the industry. Maximize facility revenue by attracting clients and increasing the value of each service job. Develop and implement promotional campaigns to encourage vehicle owners to choose our service facility. Assist technicians in handling difficult or challenging service jobs by providing insight and support. Summary : Assistant Automotive Service Manager who employs a strong work ethic and the latest technology to every repair project. Employs great communication skills to relay complex problems to customers. Schedule appointments based on customers request and job to be performed. Properly delegate work to correct technician with skillset required to complete the job. Educate customer on tire classes designs designations giving knowledge and assistance in selecting the correct tire for their application. Maintain an inventory of new passenger and light truck tires based upon reports and sales in the area. Assist less experienced technicians with procedures to diagnose and repair. Maintain inventory of mechanical parts needed for repairs and maintenance. Created inspection forms for mechanical repairs to ensure consistency and accuracy of repairs and evaluations. Maintained direct contact with the business owner of day to day operations and sales. Led my team to largest gross profit year that business had ever accomplished. Assisted in the training and certification of multiple apprentice technicians. Objective : I have experience in various aspects of the automotive field working closely with cross functional teams, customers, and vendors. 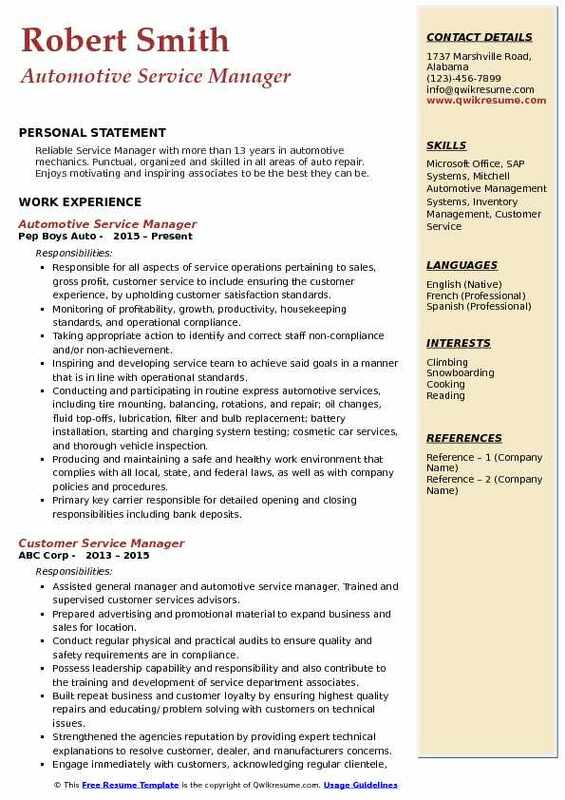 I have worked in the corporate world as an inventory analyst and am currently employed as an Automotive Service Manager. Now am seeking a new opportunity to further develop my skills and grow as a professional. Maintain customer relations to ensure long-term growth in sales and profits and retain customers. Assisted service advisors with overflow, scheduled service appointments, performed walkarounds with a client for service check-in. Provided alternate transportation if needed. Quickly reverse the downward spiral in revenue levels with innovative sales techniques. Train new and existing staff on day-to-day operations and specific job duties. Review applications, schedule and conduct interviews, hire and terminate when necessary. Deliver detailed estimates to customers after completing an initial inspection/ diagnosis. Manage the part inventories to improve job time completions and maintained vendor. Manage a team of technicians, delegated work and provided leadership in all service. Ensure that customer and employee areas were kept clean and organized. 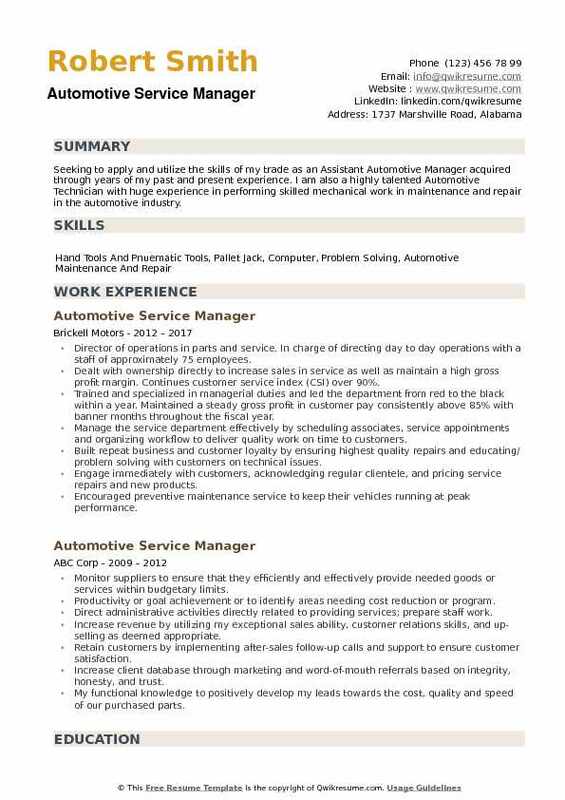 Summary : Experienced in the automotive industry, by generating service order estimations and quotes for customers. Able to schedule appointments; maintain an organised schedule. Ability to conduct post-repair follow up; resolve customer complaints. Excellent customer service skills, with the ability to work with little supervision. Driven to succeed in a fast-paced, high-volume environment. Assigned workers to perform activities, such as service appliances, repair and maintain vehicles, and install machinery and equipment. Conferred with personnel, such as management, engineering, quality control, customers, and workers representatives to coordinate work activities and resolve problems. Monitored operations, and inspected, tested and measured completed work, using devices, such as hand tools, gauges, and specifications to verify conformance to standards. Computed estimates and actual costs of factors, such as materials, labor, and outside contractors, and prepare budgets. Completed and maintained reports, such as time and production records, inventories, and test results. Established and adjusted work methods and procedures to meet production schedules, using knowledge of capacities of machines, equipment, and personnel. Recommended measures, such as procedural changes, service manuals revisions, and equipment. 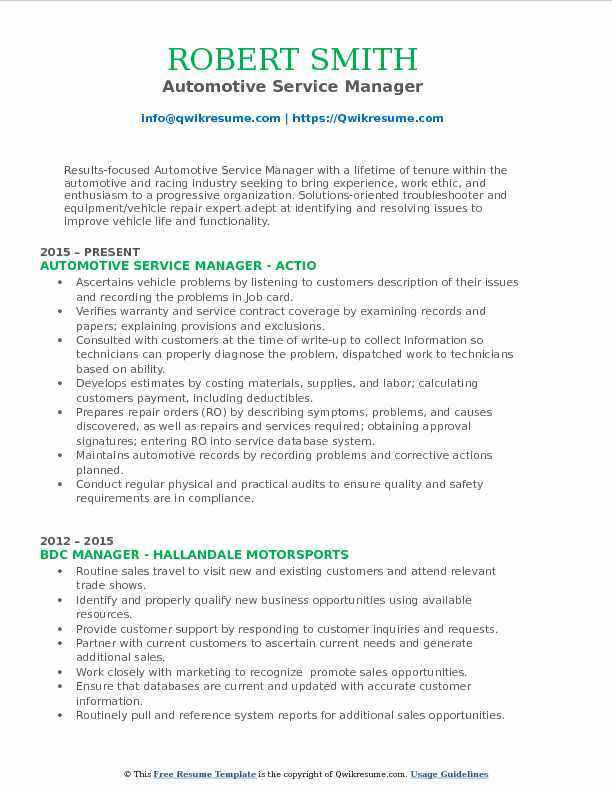 Headline : Results-focused Automotive Service Manager with a lifetime of tenure within the automotive and racing industry seeking to bring experience, work ethic, and enthusiasm to a progressive organization. Solutions-oriented troubleshooter and equipment/vehicle repair expert adept at identifying and resolving issues to improve vehicle life and functionality. Ascertains vehicle problems by listening to customers description of their issues and recording the problems in Job card. Consulted with customers at the time of write-up to collect information so technicians can properly diagnose the problem, dispatched work to technicians based on ability. Develops estimates by costing materials, supplies, and labor; calculating customers payment, including deductibles. Conduct regular physical and practical audits to ensure quality and safety requirements are in compliance. Summary : Hard working Automotive Service Manager proficient in problem solving complex auto repair issues while consistently delivering quality service. Service Advisor who employs a strong work ethic and is focused on quality and customer satisfaction. 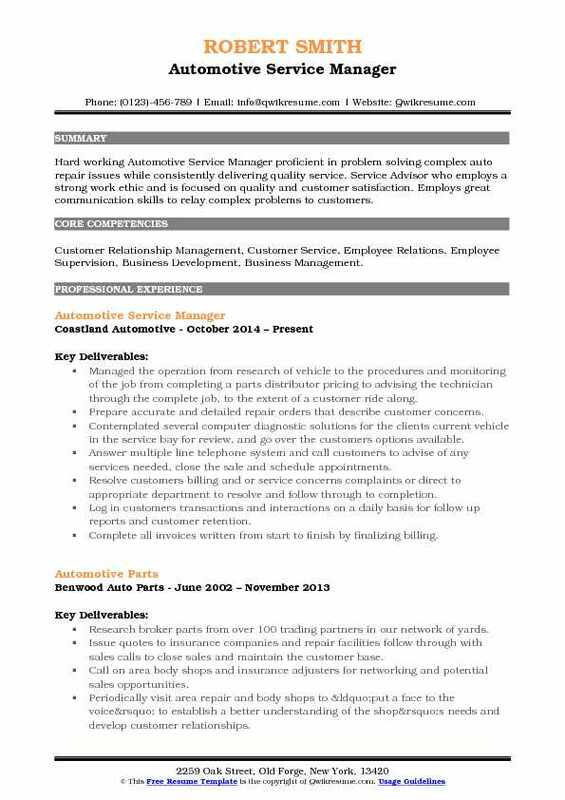 Employs great communication skills to relay complex problems to customers. Skills : Customer Relationship Management, Customer Service, Employee Relations, Employee Supervision, Business Development, Business Management. Managed the operation from research of vehicle to the procedures and monitoring of the job from completing a parts distributor pricing to advising the technician through the complete job, to the extent of a customer ride along. Prepare accurate and detailed repair orders that describe customer concerns. Answer multiple line telephone system and call customers to advise of any services needed, close the sale and schedule appointments. Resolve customers billing and or service concerns complaints or direct to appropriate department to resolve and follow through to completion. Log in customers transactions and interactions on a daily basis for follow up reports and customer retention. Complete all invoices written from start to finish by finalizing billing. Periodically visit area businesses to put a face to the voice and establish a customer base for potential sales. Headline : Reliable Service Manager with more than 13 years in automotive mechanics. Punctual, organized and skilled in all areas of auto repair. Enjoys motivating and inspiring associates to be the best they can be. Responsible for all aspects of service operations pertaining to sales, gross profit, customer service to include ensuring the customer experience, by upholding customer satisfaction standards. Monitoring of profitability, growth, productivity, housekeeping standards, and operational compliance. Taking appropriate action to identify and correct staff non-compliance and/or non-achievement. Inspiring and developing service team to achieve said goals in a manner that is in line with operational standards. Conducting and participating in routine express automotive services, including tire mounting, balancing, rotations, and repair; oil changes, fluid top-offs, lubrication, filter and bulb replacement; battery installation, starting and charging system testing; cosmetic car services, and thorough vehicle inspection. Producing and maintaining a safe and healthy work environment that complies with all local, state, and federal laws, as well as with company policies and procedures. Primary key carrier responsible for detailed opening and closing responsibilities including bank deposits. 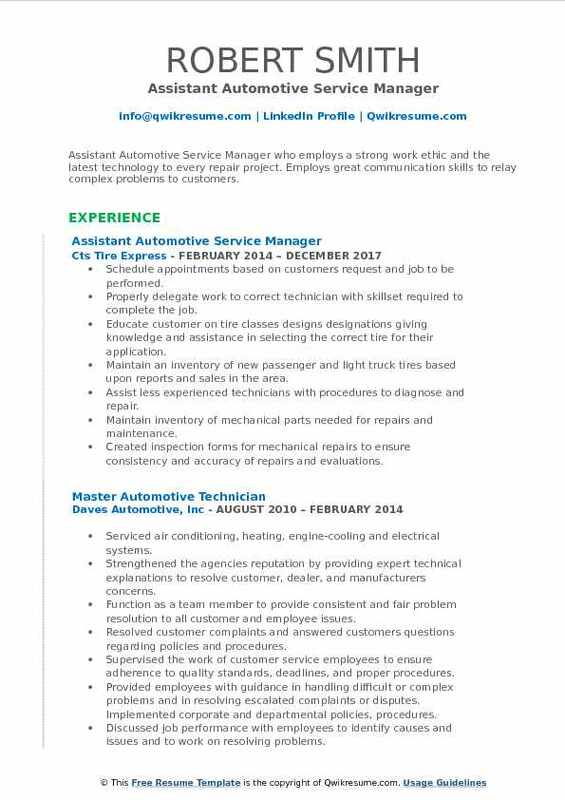 Summary : Seeking to apply and utilize the skills of my trade as an Assistant Automotive Manager acquired through years of my past and present experience. I am also a highly talented Automotive Technician with huge experience in performing skilled mechanical work in maintenance and repair in the automotive industry. Director of operations in parts and service. In charge of directing day to day operations with a staff of approximately 75 employees. Dealt with ownership directly to increase sales in service as well as maintain a high gross profit margin. Continues customer service index (CSI) over 90%. Trained and specialized in managerial duties and led the department from red to the black within a year. Maintained a steady gross profit in customer pay consistently above 85% with banner months throughout the fiscal year. Manage the service department effectively by scheduling associates, service appointments and organizing workflow to deliver quality work on time to customers. Built repeat business and customer loyalty by ensuring highest quality repairs and educating/ problem solving with customers on technical issues. Engage immediately with customers, acknowledging regular clientele, and pricing service repairs and new products. Encouraged preventive maintenance service to keep their vehicles running at peak performance.